where are the test functions and and are the finite element solutions. // variable they want to be coupled into this kernel from an input file. // parameter 'velocity' used in example 2. // constant parameter used in example 2. 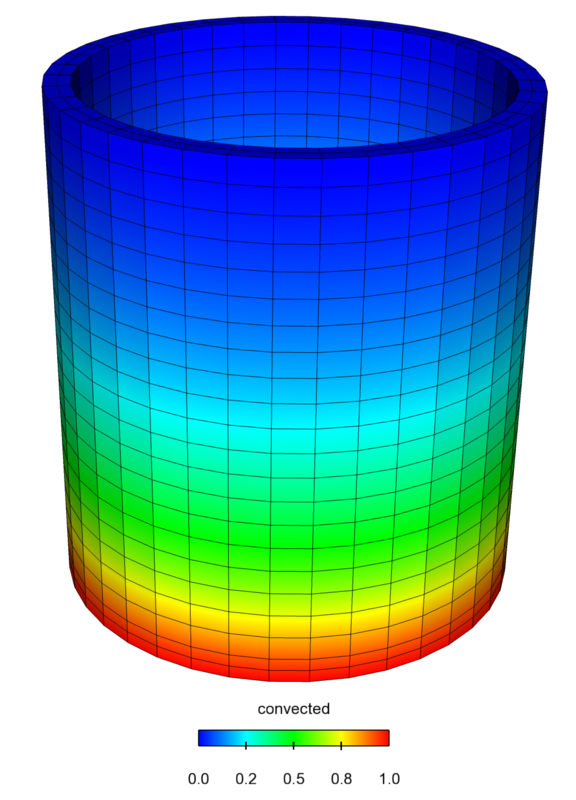 First, the mesh is defined by loading a file "mug.e". Then, the two variables are defined: "diffused" and "convected", which refer to u and v from the problem statement, respectively. Both variables in this case are assigned to utilize linear Lagrange shape functions, but they could each use different shape functions and/or orders. The problem requires three Kernels, two Diffusion Kernels, one for each of the variables and the ExampleConvection Kernel created above. It is important to point out that for the two Diffusion terms, the same code is utilized; two instances of the C++ object are created to application of the code to two variables. 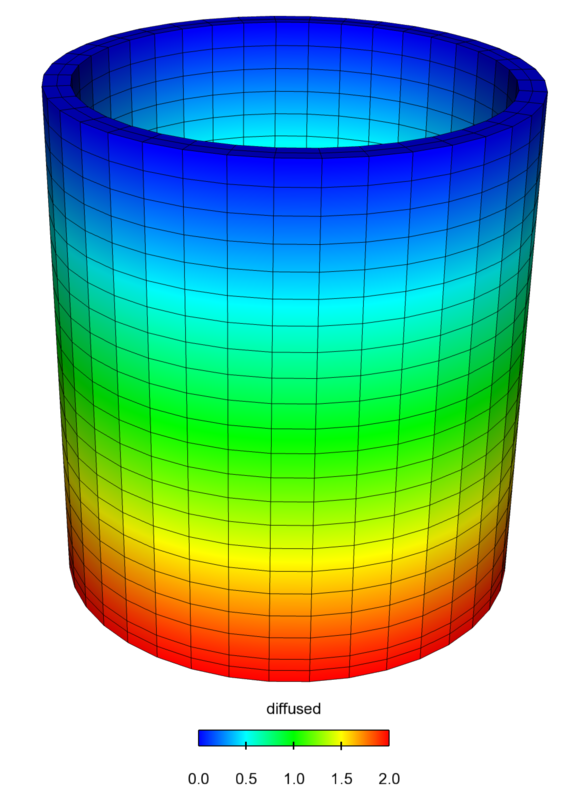 Additionally, the actual coupling of the equations takes place in the ExampleConvection object. The some_variable input parameter was created in the ExampleConvection Kernel and here is assigned to utilize the diffused variable. For the given problem, each of the variables has a DirichletBC applied at the top and bottom. This is done in the input file as follows. Finally, the Executioner block is setup for solving the problem an the Outputs are set for viewing the results. This will generate the results file, out.e, as shown in Figure 1 and 2. This file may be viewed using Peacock or an external application that supports the Exodus II format (e.g., Paraview). Figure 1: example 3 Results, "diffused variable"
Figure 2: example 3 Results, "convected variable"